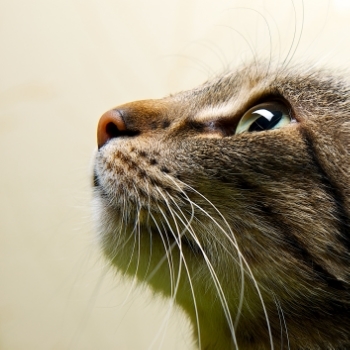 Have you ever noticed little bumps or “blackheads” on your cat’s chin? Perhaps they’ve even progressed to full fledged “zits” by the time you’ve noticed them? These signs are often, though not always, an indication of what’s commonly referred to as “chin acne” in cats. For deeper or more persistent cases, you’ll need to see your vet for safe and effective treatment. However, for mild cases of chin acne, simple cleaning at home and some changes to your cat’s meal time routine may just do the trick. Talk to your veterinarian about pet safe acne pads or cleaners to gently clean your cat’s chin. Use a product with Benzoyl Peroxide or Chlorhexidine as the active ingredient. Take care to avoid products containing Salicylic Acid (in most of the over-the-counter human acne pads), as salicylic acid can be toxic to cats and their chin is an area they often lick. Keep your cat’s chin clean and dry, taking care to wipe their chin following their meals or after drinking if they’re particularly messy eaters/drinkers. Switch from plastic feeding and drinking bowls to ones made of stainless steel or glass. The plastic bowls have a higher likelihood of irritating your cat’s skin and/or harboring bacteria when they get scratched up and damaged during normal every day use and cleaning. Wash your cat’s feeding and water bowls daily, even the stainless and glass ones. Again, not all cases of bumps on your cat’s chin will be simple “cat acne.” Conditions such as mange, yeast infections, and others can also appear as bumps, blackheads, and zits on your cat’s chin. If your cat’s signs don’t resolve with the tips provided above, if the area affected is increasing, or if your cat has any other concerning signs a trip to your vet is definitely in order.